Yes, I’m a tad bit on the crazy side. I admit it. As I stated in the title, you’d probably consider me just left of normal…well, actually right, depending on the day. But I love to have fun, I love to laugh and I love those around me. And I’m very impressionable. As in, you can make a suggestion to me, and for some reason my mind believes that things MUST be that way. For example…tell me there’s a man outside my window at night. I become freaked, hear the strangest of sounds and am ready to call 9-1-1 at a moment’s notice. My friends in school used to get a real kick out of it. Scary movies were really entertaining, because I couldn’t sit still, would scream and then wouldn’t sleep for weeks. Fun stuff. What difference does all this make? Well, it’s moved with me into adulthood. And this time, it’s kinda funny. Of course, I immediately thought of my grandmother. She’s been gone more than a year, and I still miss her so much every day. Not only that, but she would have celebrated her 91st birthday just a few days before, so I was content that the spider was her, telling me she loves me, supports me and misses me too. 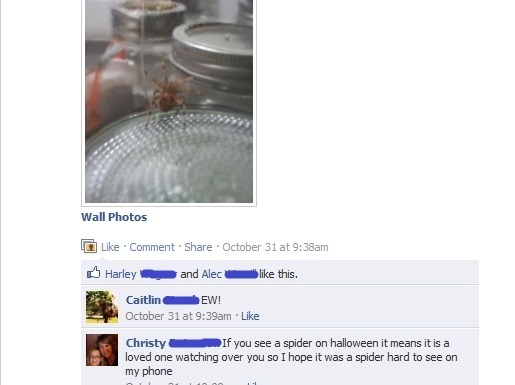 So I kept the spider in the jar, talked to it, watched it…even fed it a few flies. I figured a day or two, the spider would die and all would be well. Here we are, more than a week later, and this spider is still alive. And now I can’t kill it. I’ve tried. I want to, really I do…but…well…I can’t. I even asked Mark to kill it last night, while I was sleeping. He said no. This entry was posted in About me, farm fun, Nature and tagged children, farm life, Halloween, life on the farm, nature, spider by wagfarms. Bookmark the permalink. Did you just let it outside???! Feeling sure it cannot live in jar forever!! The only reason I haven’t let it outside is that it’s barely 40 out, so I know it won’t make it. I may just get up the gumption to let it out today. Silly me and my silly notions!